In a Brandon Hall Group study, researchers reported the majority of organizations (83%) said targeted development for all leader levels is important or very important. While leadership development and training is on the minds of many organizational chiefs, what are the first steps to reaching this goal? In order to best develop your leaders, the most important skill to address is communication. Learn how to start difficult #management conversations the right way with these starter phrases from @InspireSoftware:Tweet This! By starting off a conversation with this kind of honesty, you are able to strip away any doubts that you may be sugar-coating news or feedback you are about to give. Believe it or not, 25% of employees do not trust their employers, but by initiating a conversation with this tactic, you are able to display transparency which leads to more engaged employees and teams. Try to avoid starting these types of conversations with phrases like, “Let me be honest with you...” or “If I’m being completely honest…” because this may give the impression you are not honest during other conversations you may have with the employee. Use this phrase to start a hard conversation such as solving a difficult problem or stressing a significant feedback point. This may be in response to an idea proposal, a team goal, asked in a formal performance review or even just a general career aspiration. Asking this question gives you the chance to hear goals from the employee’s perspective and may even change your opinion or own perspective on a particular achievement. It’s important to know the goal in any situation and working together to define clear and attainable goals is the best way to progress forward as a team and company altogether. After an employee has proposed an idea, this is a great way to recognize the idea’s ownership and proceed with the implementation. It lets the individual know you trust their idea and expertise to move forward with this plan of action and see how it turns out. While this conversation phrase recognizes the employee’s plan, it also conveys a sense of responsibility. While organizations are lead by decisions based off numbers and figures, it’s easy to forget the humans at the company who are doing the work are not just another number and do have some feelings on the matter. Many individuals are driven by feelings and taking the time to ask how someone may feel about a certain situation or decision can help employees know they are indeed not just a number and matter. This conversation phrase is best used when you sense there is something the employee may have left unsaid or you are addressing a conflict resolution. Improve your #leadership training by starting with the fundamentals — #communication skills.Tweet This! Refocusing on the positive is a great leadership tactic to get everyone back on track, especially when it feels like nothing seems to be going right lately. Ask what IS working when grumbles start to get louder. Starting with the positives and building from there can help steer everyone in the right direction to achieve the organizational, team and individual goals. Refocusing on practical points of leadership like communication skills is a great way to boost leadership development and training. By reviewing conversation phrases, leaders in your organization will feel better equipped to reach goals that are set. Need help with your leadership development? 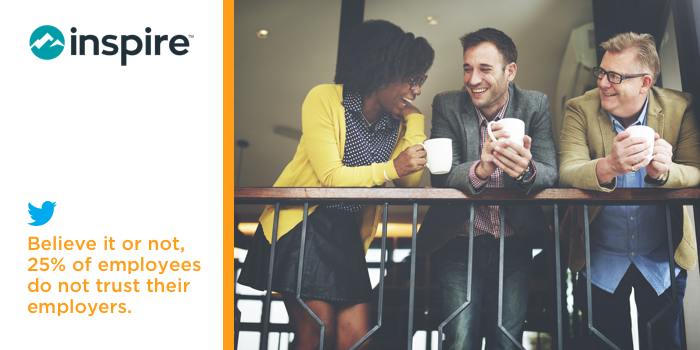 Book a demo with Inspire Software and learn how we can supercharge your company with a transparent look into your goals, team and the leaders of today and tomorrow.